Biochar has been around for millions of years, since the first fires burned the first organic materials. Centuries ago, indigenous tribes in Brazil discovered how to produce biochar to enrich the poor rainforest soil called Terra Preta, but the technology was lost for hundreds of years. Michael Wittman, CEO of Blue Sky Biochar, believes this old technology is a powerful tool for reducing carbon in the atmosphere while increasing agricultural yields. As a high school student, Wittman volunteered at the first Earth Day celebration in 1970. His passion for the environment and his entrepreneurial spirit, still burning bright over 40 years later, led him to be involved in a number of environmental ventures. His latest, Blue Sky, began several years ago as a biofuel company. But a chance meeting at an Earth Day event with Mike Ballantine, CEO of International Tech Corporation, in 2008 would eventually change that focus. About four years ago, Wittman decided to go into biochar as well. 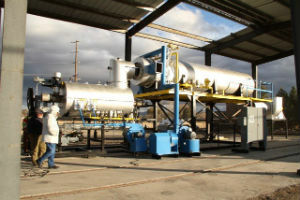 Not only is he now the vice-president of biochar development for International Tech Corporation, he also decided to phase Blue Sky from biofuel into biochar, distributing the biochar that International Tech Corporation produces in Oregon. Biochar is produced when organic material is indirectly heated to high temperatures without oxygen. The biochar Blue Sky distributes is made from forestry waste materials, such as wood chips and saw dust, which prevents them from being discarded into landfills. “It’s important to use material that’s in our waste streams, not our valuable resources,” Wittman says, noting that the biochar he sells is not produced from freshly cut lumber but the waste from that process. “There’s more than enough waste material out there to make biochar on an endless scale,” he says. Once the organic material is processed, it must have nutrients added to it. Raw biochar will actually leach nutrients out of the soil for a few years before it starts to add back, so it needs to be charged with nutrients, or inoculated, so it can begin working as soon as it’s added to the soil. The biochar that Blue Sky Biochar distributes goes a step further and turns the biochar powder and granules into pellets that won’t blow dust all over the place. Blue Sky Biochar holds moisture and nutrients in the soil instead of allowing it to run off, says Witmann, significantly reducing water and fertilizer requirements. And because it is very porous, it offers an inviting habitat for natural microbial flora to thrive in. “Kind of like a super luxury condo for microbes in the soil,” explains Wittman. Biochar can also be used to enrich compost. It encourages worms to move into compost piles, reduces waste gases from entering the atmosphere, and increases nitrogen retention in compost piles 50 to 75 percent. One aspect of biochar that Wittman is most passionate about is its potential to scrub excess carbon from the atmosphere. For every pound of biochar put into the ground, three pounds of carbon don’t enter the atmosphere. “When biochar starts getting used on a very massive scale worldwide, it will start to reverse the clock of carbon in the atmosphere, more than any other technology that we have come across,” he says. Although biochar itself is millions of years old, its use as a soil amendment technology by modern humans is fairly new, so Wittman focuses much of his marketing on education. He founded the Southern California Biochar Initiative, which starting next year will hold forums and demonstrations. Some of these demonstrations will include information on how to produce biochar at home. Why teach people how to make the very thing he’s trying to sell? One of the challenges for the biochar industry that Wittman sees is scaling up. Right now, biochar is too expensive to be attractive to big agriculture; most of his customers are home gardeners or community gardens and small farms. He’s also looking forward to when it is produced regionally to decrease shipping costs and the carbon footprint that comes with that. He does distribute nationally and to Canada, but at the moment all the biochar he distributes is produced and shipped out of southern California and Oregon. Blue Sky is still in the scaling up stage itself. Wittman is self-financing the venture, which hasn’t yet turned a profit, but he would eventually like it to become a one-stop-shop for all things biochar, including books, apparatuses to produce biochar on small and large scales, and of course, biochar itself. Wittman hopes that one day biochar is mainstream and used on a massive scale, including with big agriculture.